Jacques Torres is world renowned for his decadent chocolate treats available in his New York shops… and now on SimplyChocolate.com! Serving chocoholics around the world, the James Beard award-winning pastry chef crafts nostalgic chocolate treats, including the most perfect chocolate chip cookies in New York. Note: During Holiday season Jacques' Choice includes the special edition holiday bonbons. *The actual selection of flavors within each box may vary from those pictured here. Allergens: Prepared/packaged using machines that process dairy, soy, wheat/gluten, fish, eggs, nuts, tree nuts and peanuts. Contains nuts, peanuts, milk, soy. James Beard award-winning pastry chef, Jacques Torres is world renowned for his decadent chocolate treats available in his New York shops… and now on SimplyChocolate.com! 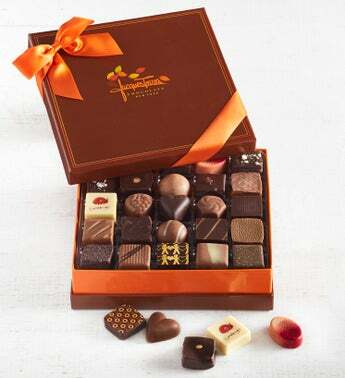 Jacques Torres Chocolate is known for fresh premium chocolates that use REAL ingredients, never any preservatives or essential flavoring oils. There is something for everyone in this signature box with flavors ranging from caramels, pralines, fruits, wine, exotic teas, a "mystery" flavor and a number of other Jacques' creations.